The United States has successfully shot down a mock intercontinental ballistic missile, its first-live fire test, using its own upgraded long-range interceptor warhead, in what was widely seen as a test of America’s ability to counter growing threat from North Korea. The US military fired an intercontinental ballistic missile-type weapon on Tuesday from the Kwajalein Atoll in the Marshall Islands. It then fired a missile to intercept it from Vandenberg air force base in California. This was the first live-fire test event against an ICBM-class target for Ground-based Midcourse Defence and the US ballistic missile defence system, the Pentagon has said. 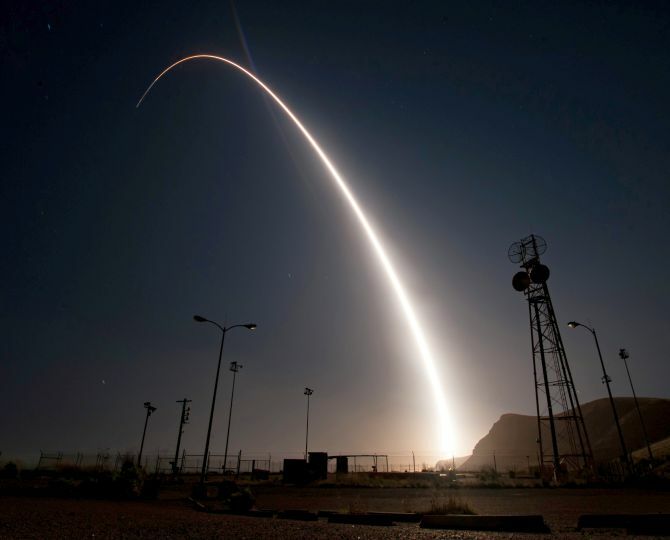 GMD is an integral element of the United States’ layered ballistic missile defence architecture, with interceptors at Vandenberg Air Force Base and Fort Greely, Alaska. The programme comprises command-and-control facilities, communications terminals and a 20,000-mile fibre-optic communications network that interfaces with ballistic missile defence radars and other sensors. “The intercept of a complex, threat-representative ICBM target is an incredible accomplishment for the GMD system and a critical milestone for this programme,” said Missile Defence Agency Director Vice Adm Jim Syring. “This system is vitally important to the defence of our homeland, and this test demonstrates that we have a capable, credible deterrent against a very real threat,” he added. According to Pentagon, initial indications are that the test met its primary objective, but programme officials will continue to evaluate system performance based upon telemetry and other data obtained during the test. The one-time test costs $250 million (Rs 1,612 crore) to the Department of Defence. The test, designated Flight Test Ground-Based Interceptor-15, will provide the data necessary to assess the performance of the GMD system and provide enhanced homeland defence capabilities, it said. The GMD element of the ballistic missile defence system provides combatant commanders the capability to engage and destroy intermediate and long-range ballistic missile threats to protect the US. The continental US is about 9,000 km from North Korea. ICBMs have a minimum range of about 5,500 km, but some are designed to travel 10,000 km or farther. North Korea has dramatically ramped up the pace of its missile tests over the past year, with a goal of developing an ICBM that can strike the US mainland. “We improve and learn from each test regardless of the outcome. Our goal is to continue to be able to tell you with confidence that we have the ability to defends the homeland against this nascent ICBM threat,” Davis said. “This successful test keeps the United States on track for a significant increase in interceptor inventory of 44 in 2017,” said Norm Tew, vice president and GMD program director. US lawmakers congratulated the Pentagon on this successful test. “After an investment of more than $40 billion since 2002, it’s good that the Missile Defence Agency is finally doing a missile defence test against an ICBM target, some 13 years after the first Ground-Based Interceptor system’s deployment,” Smith said in a statement. “By successfully shooting down an ICBM-class target, America demonstrated that we can defend ourselves from nuclear attack. And the world should know that America will defend itself from nuclear attack. I hope that our enemies were all watching closely and took note of what we are capable of achieving,” Congressman Doug Lamborn said. After his latest missile, what does Kim want? Is Kim Jong-un planning for war?